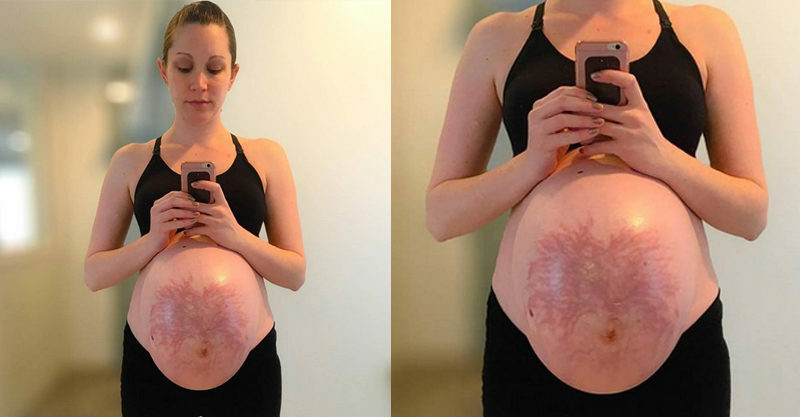 When one mother shared some extraordinary photos of her pregnant and postpartum tummy, she proved that we don’t have to be scared or ashamed of our stretch marks. Instead, maybe it’s time we ditch the unrealistic expectations, scrap the photoshop, and share the story of our beautiful battle wounds. Kristin Niemi was 40 weeks pregnant with her second child when she posted a picture of her belly on Instagram. But this wasn’t any old stylised pregnancy shot, this incredible photo showed a bright web of stretch marks spreading across her belly. Mothers talk a lot about keeping it real, but when it comes to accepting the realities of pregnancy and the physical marks it leaves on our bodies – we often go quiet. And social media doesn’t always help. As Kristin explained to Babyology, she kept seeing overly filtered and “dolled up” pregnancy photos on Instagram. She admits she posted some too. But then she decided to try a different approach. One look at the comments on Kristin’s post, and it’s clear the picture struck a chord with other women. No one was judging, in fact many instantly saw the beauty in the marks, which remarkably resemble a tree of life. The hugely positive response to Kristin’s post reveals just how much we need an unfiltered conversation about stretch marks – that so many of us get them during pregnancy, that they’re not something to cover up, that they’re lifelong reminders of nine extraordinary months. If you’re doing the maths on Kristin’s due date – yep, she had a beautiful baby boy. And now that she’s on the other side, she’s staying true about the realities of a post-partum body. Just one week after giving birth, she posted this before and after pic, showing the amazing changes to her belly. As most mothers with stretch marks can testify, the marks fade, but most of us still carry a few battle wounds for life. This can take time to accept, but it sure does help when mothers like Kristin share their journey. How did you feel about your pregnancy stretch marks?